Please share our Holiday Family Session info with all of your dog loving friends! This season we are giving back to honor the life of our girl Tess who passed away in August. My days are harder without her in my life, but we are SO thankful for all of the great portraits we got of Tess before we had to say goodbye! Our favorite was a family portrait taken JUST LAST SUMMER before we even knew her health was in trouble. It was our Christmas card photo, and will hang in our house forever. Please share this session information below through Facebook, Google+, Twitter, or link it in an email. 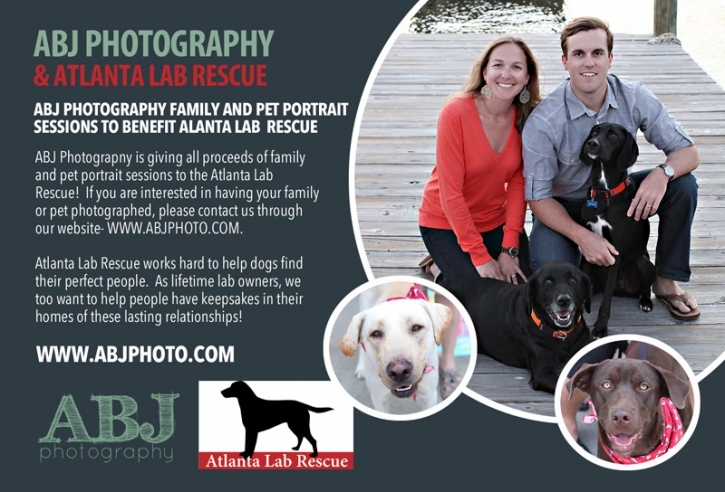 All proceeds will go to Atlanta Lab Rescue and we could all help so many dogs not only find homes, but get heart-worm treatments, eye surgeries, food, and any other aid needed from being lost and forgotten! Click the Email Me button above to book your session today! Anne-Caroline Brown Taylor - Angela Deeds gave me your info. I am a lab fanatic who works with SOS Lab Rescue. I would love to book an appointment with you to take a huge group pic for the holidays. Can you help me? Also, we are having a benefit at our house in Nov. WHat would the cost be for you to do a photo booth type thing, if that is even possible? Call me when you can, please. Thanks! Cannot wait to meet you. Prayers to you and your family and your sweet Tess. We just lost Bandit 2 weeks ago… she was a service dog we took in 5 years ago when her owner (our friend) died. I am still heartbroken.